Transmission electron micrographs of whole metaphase chromosomes isolated from Chinese Hamster Ovary (CHO) cells showing the characteristic paired chromatids and centromeric constrictions. The upper image shows a metaphase chromosome after mitotic cells were swollen in 0.075M KCl, fixed in 3:1 methanol:acetic acid, squashed in 50% acetic acid, stained with uranyl acetate and observed using transmission electron microscopy. The chromosomes consist of loops of ~30nm diameter chromatin fibers. 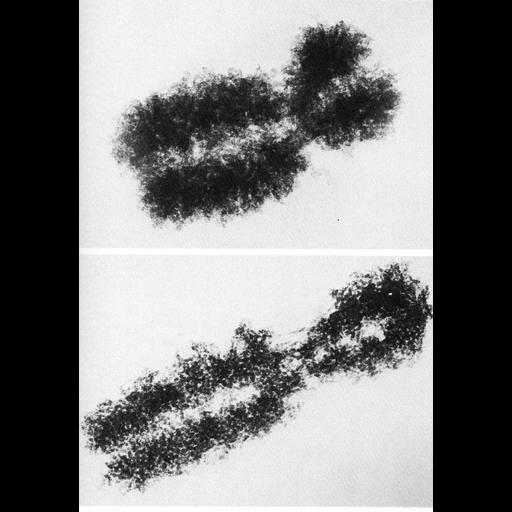 The lower image shows chromosomes also isolated from CHO cells using the non-aqueous method of Wray and Stubblefield in the presence of calcium. Under these conditions, chromatin loops are ~50 nm in diameter. These images were published as Figures 128 (upper, from H. Ris, Electron Microscopy, 1956) and 129 (lower, reprinted with permission by Academic Press, from H. Ris and J. Korenberg in Cell Biology, V2, Goldstein and Prescott, eds.) from Chapter 4 (Nucleus) of 'The Cell, 2nd Ed.' by Don W. Fawcett M.D. A PDF copy of the accompanying chapter is available on the ASCB's BioEDUCATE website.